Wireless microphone ceremony system includes (2) wireless clip-on microphones, background music as the guests arrive, processional, and recessional music. This is a completely separate system from what the DJ will be using so there is no moving of equipment once the event has begun. Full room wireless uplighting engulfs the venue in elegance and energy with the DJ having the ability to control the lighting and able to sync it to the beat of the music. We can achieve any color combination possible. Our photo booth comes with an on-site attendant to assist your guests and troubleshoot any issues that may arise, it includes a personalized photo strip with your name and date, props for the guests to use in the booth, high quality image digital photo album, and your choice of gold, silver, black, or red backdrop. Background cocktail hour music as your guests mingle and nibble on appetizers. This is also a separate system from what the DJ will be using so there will not be any moving or interchanging of equipment once the event has begun. Included in all pricing are any fees, taxes, etc. The prices are final with no hidden fees. Included is any time needed for set-up and break-down. 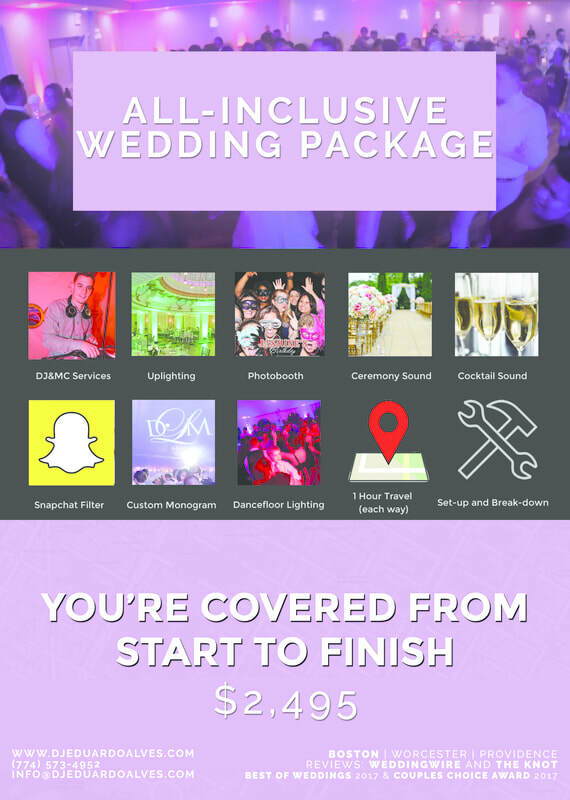 Typically we arrive 1.5 hours in advance for our basic DJ package and at least 3 hours in advance for our all-inclusive package. We need 30 to 45 minutes for equipment break-down. We do not charge extra for this. ​Included as well is up to 1 hour of travel (2 hours round-trip) from our office in Milford, Massachusetts. Additional travel time is $30 per half-hour.